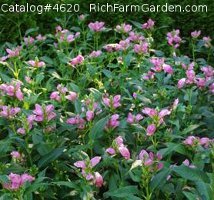 Also known as Turtlehead or Shellflowers, Chelones are members of the Figwort family, Scrophulariaceae. They bear tubular blooms on erect stems and make excellent pond side specimens. Ordinary well drained garden soil is fine for these tough beauties and they will thrive even in moist, boggy locations or by streams or lakes. Partial or dappled shade works better than full sun. The name turtlehead refers to the shape of the bloom. Propagation is performed by digging and dividing existing plants, taking cuttings in summer, or by sowing seed. Seeds should be sown in pots, trays or a bed prepared with a soiless medium (1 part sand to 1 part sphagnum peat moss is fine) and covered lightly. The medium should be kept moist, but not soggy at about 40F for about 32 weeks, then increase the temperature to 70F. WHen seedlings reach a height of 2 inches, they should be transplanted to larger containers or directly outdoors, if the outdoor temperatures remain above 55F. 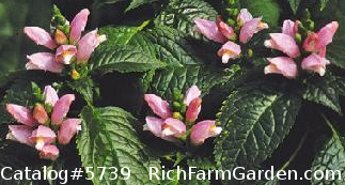 3 inch long cuttings can be taken from new growth and rooted in moist sand or in a mix of sandy loam and leaf mold. These will root quickly and can then be transplanted to containers or, if the outdoor temperature do not fall below 55F, they can be set outdoors in a prepared bed.